Are you ready to protect the creatures of myth and legend? Then you belong in The Unicorn Rescue Society. HURRY–THE CREATURES NEED YOU! Elliot has ever met. And the only kid who will talk to Elliot, Uchenna Devereaux, isn’t afraid of danger. She likes danger. Elliot and Uchenna are about to become part of a secret group of adventurers, The Unicorn Rescue Society, whose goal is to protect and defend the world’s mythical creatures. Together with Professor Fauna, Elliot and Uchenna must help rescue a Jersey Devil from a duo of conniving, greedy billionaires, the Schmoke Brothers. 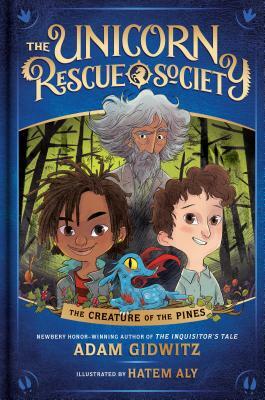 Join Elliot and Uchenna on their very first quest as members of the Unicorn Rescue Society in this brand-new fantasy-adventure series from Adam Gidwitz, the beloved bestselling and Newbery Honor-winning author of The Inquisitors Tale and A Tale Dark & Grimm. Illustrated throughout, this is the perfect fit for newly independent readers looking for a story full of adventure, fun, and friendship. Adam Gidwitz is the author of the critically acclaimed, New York Times bestselling Grimm trilogy. He spent six years researching and writing his Newbery Honor-winning The Inquisitor's Tale, including a year living in Europe. Adam lives with his family in Brooklyn, NY. Find Adam online at adamgidwitz.com or @AdamGidwitz. Chris Lenox Smith is the Creative Director and cofounder of Mixtape Club, an award-winning audiovisual creative studio. Mixtape works with a range of brands and artists, including Google, HBO, ESPN, Spotify, Primus, and They Might Be Giants, to create memorable, narrative-driven films. Chris is a two-time winner of the ADC Young Guns Award for animation and music composition, his work spans across media, from short films and commercial work to musical scores that marry influences from the precomputer era with modern techniques. Jesse Casey is the Managing Director and cofounder of Mixtape Club, an award-winning audiovisual creative studio. Mixtape works with a range of brands and artists, including Google, HBO, ESPN, Spotify, Primus, and They Might Be Giants, to create memorable, narrative-driven films. Drawing from his twin backgrounds in computer programming and printmaking, Jesse's work embraces contemporary technology as a means to recreate the craft and artistry of classic film and animation. Hatem Aly is an Egyptian-born illustrator whose work has been featured on television and in multiple publications worldwide. He currently lives in New Brunswick, Canada, with his wife, son, and more pets than people. Find him online at metahatem.com or @metahatem. A 2019 E.B. White Read-Aloud Award (Middle Reader) Finalist!